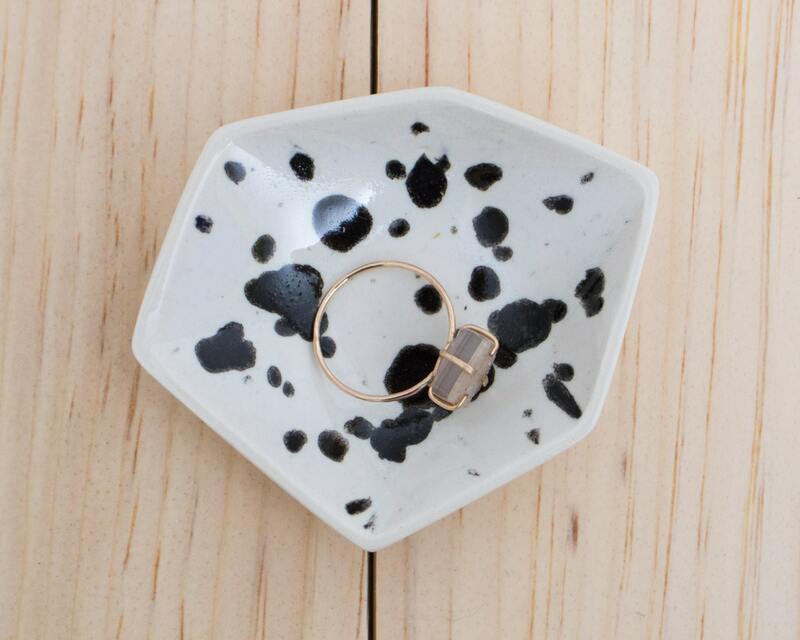 Set this small ring dish on your dresser or side table to keep your rings, necklaces, earrings and small jewelry safe. Each dish is around 3" long, 2 3/8" wide and 1/2" tall. These delicate dishes are only 1/8" thick. These are not safe for use with food. Each dish is packed with pine straw in a celo bag. We sell these small dishes in sets of three also! Want something larger? Check out our Large Ring Dishes. Same shape and style, but fit multiple rings, keys, bangles and more! Everything in our shop has been made completely by us, from prototype to final piece. Due to it’s handmade nature, you can expect the normal imperfect characteristics that come with anything handcrafted. That being said, we are diligent about making sure all pieces that leave our shop meet high quality standards. We hope you enjoy this handmade piece, from our home and hands to yours! It took me forever to find this design available somewhere, so I was SO HAPPY when I found this. My friend loves Dalmatians so this dish was perfect for her. She loves it!! Thank you!! A lovely design and a great size. Thank you! The dish arrived on time and packaged well! It's adorable and perfect to fit a few pieces of jewelry. Great quality and is exactly what I was looking for. Just what I wanted. Cute, simple, and feels nice and sturdy. Thanks! Small Geometric Ring Dish set of 3 in Ink Spots. Small Geometric Ring Dish set of 3 in Seawind.